BNSF loaded coal train C BTMAMH approaches Juilliard, Texas -- 8 miles north of Amarillo -- on the BNSF Boise City Subdivision on January 19, 2004. The Boise City Subdivision is the former Santa Fe line from Las Animas, Colorado (east of La Junta) through Boise City, Oklahoma to Amarillo. It is the southbound counterpart to the Dalhart Subdivision, which hosts mostly northward traffic north of Amarillo. From the TX-OK state line south to Dumas, the track is mostly level and straight, with easy access from US Hwy 287. South of Dumas, the tracks enter the Canadian River valley, descending toward the river on grades of up to one percent, and then climbing up toward Amarillo on the other side. The tracks cross the river on a spectacular bridge, which I have not yet photographed in a satisfactory manner. (The right combination of train traffic and favorable weather has eluded me, but some day I'll get a train there...) Boise City Sub traffic consists mostly of southbound coal loads, but unit grain trains and manifest freights are also quite common. UP trackage rights trains also operate on the Boise City Sub; some enter and leave UP trackage at the BNSF-UP crossing at Stratford; others run straight through. 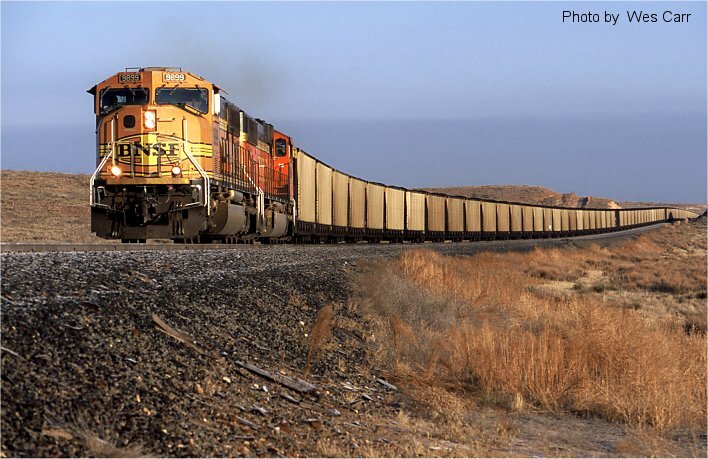 BNSF bases a roadswitcher out of the town of Dumas. There are several grain elevators and other industries in the area. One interesting location nearby is the town of Etter (about 10 miles north of Dumas), where BNSF interchanges cars with shortline Texas Northwestern. DeBruce Grain stations a former Iowa Interstate locomotive at its elevator here. If you're interested in seeing a different side of Panhandle railroading (i.e., away from the "Transcon"), the Boise City Sub is well worth a look.